Somewhere deep within, cradled in flesh and blood, our demons dwell. They feed on our darkest secrets and desires in an ill-fated world, craving only freedom. They tear through and reign upon us. 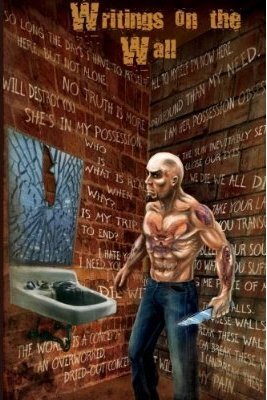 Writings On the Wall features twenty gruesome, transgressive tales of loneliness, heartbreak, and self-destruction. Where the real horrors surrounding us are each other. This is a perfect collection to pick up for the season. Just the right combination of creepy and messed up for Halloween coming up. You can tell short stories are good when you feel like you have read a whole novel in only a small number of pages. That is what this collection provided. Instead of the stories feeling like they ended abruptly or that something was missing, these provide a full and engaging story. They surely keep you turning the page. Some of them were a little out there and weird, others dealt with demons that people face everyday. These stories were marked with insanity, horror, and disturbing images. The writing throughout was really solid. Despite having all different authors, the stories didn’t seem to have many different feels to them. They flowed together well as a collection and kept you waiting to see what you would get to read next. With any collection, some stories were better than others, but as a whole they were all good. I really enjoyed reading this. Anyone who enjoys horror or books that are a bit off (think Chuck Palahniuk-esque) will enjoy this. The last story in the collection had me gagging as I was reading it. It was so descriptive and disturbing.